PowerPlant Ventures is a growth equity fund investing in emerging consumer food, beverage, and foodservice companies. We provide capital, strategic guidance and operating expertise to visionary teams leading disruptive plant-centric brands. Re-architect our global food system by advancing world-changing companies that deliver better nutrition in more sustainable and ethical ways. We are investors, founders and operators with proven track records. Clear, concise direction that unites and ignites the whole organization. The right people in the right roles, willing to run through walls to achieve the vision. Extraordinary brand and products addressing a large TAM and that resonate with consumers, retailers and distributors. Operations built to scale profitably. The right partners that share the company's vision and are engaged, committed and aligned. Our value-add toolkit goes far beyond capital and helps our portfolio companies win. Our portfolio consists of the next generation of plant-centric leaders impacting the way food is produced, distributed and consumed. Partner with us to build a better food system. Beyond Meat is on a mission to deliver the future of protein by leveraging science, culinary art and the plant kingdom. The company’s Beyond Burger is the world’s first plant-based burger that looks, cooks and tastes like fresh ground beef. Oh My Green (OMG) is revolutionizing the way people eat, experience, and think about food in the workplace. By supplying tasty nutritionist approved foods to corporate kitchens, and tech tools to optimize service, OMG enables companies to keep their employees healthy and energized. Apeel develops plant-derived technology to help USDA organic and conventional fresh food providers maintain quality, reduce waste and ensure an abundant future for our planet. Thrive Market improves consumer access to healthy foods by providing its members direct delivery of curated natural, non-GMO foods at wholesale prices. Thrive Market also gives a free membership to a low-income American family for every paid membership. Co-founded by Kimbal Musk, Square Roots is an exciting new urban farming accelerator. Their mission is to empower young entrepreneurs to create forward-thinking, responsible businesses that strengthen their communities through fresh, local food. We are eager to see thousands of new urban farm startups spring to life. Nutriati is an innovative ingredient company with a proprietary process to develop concentrated chickpea protein and gluten-free chickpea flour. Nutriati provides food manufacturers the opportunity to improve the nutrition, taste and appeal of a variety of products. This is a REBBL with a cause. REBBL (“Roots, Extracts, Berries, Bark, Leaves”) makes innovative, botanical “elixirs” designed to de-stress and energize. In collaboration with Not For Sale, 2.5% of sales go to the prevention of human trafficking. Great tasting tortilla chips made from beans. 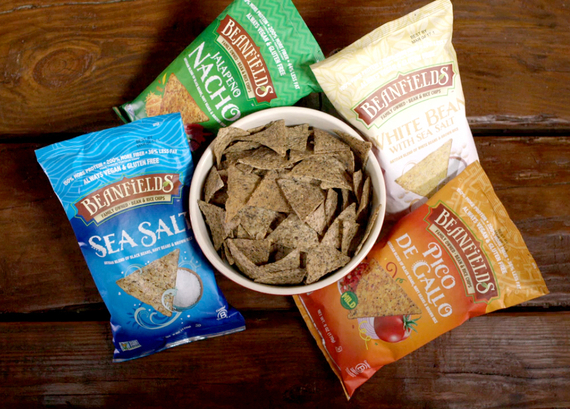 Beanfields leverages the power of beans and brown rice to deliver more protein & fiber, and less fat than traditional corn, wheat and potato chips without any taste sacrifice. Beanfields is also committed to social impact with its equity partner Homeboy Industries. Hail Merry is fast becoming the leader in fresh, healthy indulgence snacking celebrating the delicious side of pure, minimally processed plant-based ingredients. JUST is a food-technology innovator that began with a simple, plant-based Mayo, JUST Mayo that took the market by storm and is now on a path to disrupt multiple food categories with plant-based solutions. Farmer’s Fridge is an innovative healthy food provider that delivers fresh-cut salads in automated, smart kiosks. With a fully integrated supply chain, Farmer’s Fridge provides high quality and low cost salads making it easy for everyone to get delicious food fast. With an innovative process allowing it to purify plant-proteins and then combine them with other nutritious ingredients, Ripple creates delicious plant-based milks with superior nutritional profiles. High in protein, low in sugar and delicious, Ripple takes dairy-free to a new level! Treasure8 is an exciting San Francisco-based food innovation company on a mission to solve the nutritional challenges and environmental stresses of a growing global population by deploying next generation food processing systems that leverage unused produce. Veggie Grill takes better-for-you dining to a new level with flavorful, 100% plant-based soups, salads, burgers, sandwiches, bowls and desserts served in fast-casual format. The largest plant-centric restaurant company in the U.S., Veggie Grill was named one of the “25 Most Innovative Consumer Brands of 2016” by Forbes. Vive Organic wellness shots deliver ingredients in the closest possible form to the living plants they originated from. By Cold-Pressing ingredients, Vive delivers the freshest and most pure forms of natural wellness in one delicious single serving. Your Super has created functional and thoughtfully crafted products with the nutritional power of produce and the convenience of supplements. Perennial is a progressive food and beverage company leveraging the power of plants and health science to champion today’s modern 50+ consumer. Their first offering is a non-dairy nutrient-rich beverage for healthy aging that supports daily brain, bone, and digestive health. Through relentless innovation, they aim to bring a more clean and modern approach to global adult nutrition by harnessing plant-based inputs. Mark was the Founder and CEO of ZICO Beverages, one of the trailblazers of today’s $8 billion coconut water category. Under Mark’s leadership, ZICO delivered nine years of explosive growth, became one of the fastest growing beverage brands in the world, and was acquired by The Coca Cola Company in 2013. Mark was recognized as Bevnet’s 2010 Beverage Innovator of the Year and has been featured in The New York Times, The Wall Street Journal, Fast Company, Forbes, Fortune, Bloomberg, CNBC and Conscious Company. He is the Author of High Hanging Fruit: Build Something Great by Going Where No One Else Will and speaks around the world on entrepreneurship, the global food system and social impact investing. Mark has advised more than 100 CEOs, served on dozens of boards and invested in more than 30 social-impact startups across the food, beverage, foodservice, technology and alternative energy sectors. He began his career as a Peace Corps Volunteer in Central America and has as a BA in business from Marquette University, and an MBA and Masters in Environmental Management from Duke University. Mark enjoys yoga, paddle boarding, and traveling to remote corners of the world where life moves at a slower speed. Dan is the Co-Founder and Board Chairman of Health Warrior, a plant-based superfood company. Within the first year of launching, Health Warrior’s Chia Bar was the #1 best-selling new bar in the natural channel. Today, Health Warrior is a nationally recognized brand and is on a mission to make radically convenient, real food and positively influence the health habits of Western civilization. Prior to diving into entrepreneurship, Dan spent 15 years working on Wall Street as a Partner at a large investment management firm. Dan has experience investing in a breadth of companies, up and down the capital structure, and across the globe from the United States to Latin America, Europe, Middle East and Asia. When Dan is not investing, he can be found on the trails of Northern California mountain biking and trail running. Dan is a 2X Ironman, marathoner, and celebrated his 40th birthday by competing in a 24-hour Spartan Race in Iceland. He is also a proud 2X dad. Dan has a BA from Colgate University. Kevin was born and raised on Long Island where he developed an aversion to cold weather. This led to 4 years at Arizona State University graduating with a B.S. in Business promptly followed by a quick sprint to Los Angeles to join Drexel Burnham Lambert. After 10 years of high yield financing, he created Standard Capital Group where he spent 15 years advising small and middle-market companies before co-founding Veggie Grill which has grown to 35 locations serving in excess of 1 million guests every 90 days, making it the largest plant-centric restaurant company in the United States. Forbes recently named Veggie Grill one of the “25 Most Innovative Consumer Brands”. Kevin serves on the advisory boards of The Good Food Institute, Tufts University Friedman School for Entrepreneurship, and UCLA School of Law Resnick Program for Food Law and Policy. He enjoys family, friends, good wine, U2, scuba diving and the endless pursuit of perfecting his very imperfect golf game. Pillan co-founded Veggie Grill, the largest plant-centric restaurant company in the United States. With locations up and down the West Coast and starting to expand eastward, Veggie Grill was recently named one of the “25 Most Innovative Consumer Brands of 2016” by Forbes. Pillan received a B.S. in engineering from MIT, an MBA from UCLA, and is a member of YPO. Prior to entering the food arena, Pillan co-founded Guidance Solutions, one of Los Angeles’ first e-commerce development firms. The company was one of LA’s 15 fastest growing technology companies three years in a row, raised $25 million in growth capital, and continues to operate today. When not helping to advance a plant-centric future, Pillan enjoys playing beach volleyball and trying to reclaim his glory days of playing collegiate baseball and basketball at MIT.